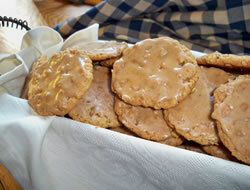 Yummy old-fashioned oatmeal cookies. 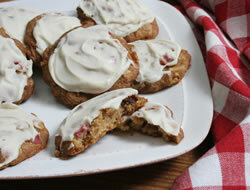 The cinnamon-flavored frosting makes a glaze on the cookies that is the perfect finishing touch. These are sure to be a family favorite. In a large bowl, mix the margarine (or shortening), white sugar, brown sugar, eggs, and vanilla until smooth and creamy. In another bowl, blend the flour, baking soda, salt, and quick oatmeal. Add this dry mixture to the creamed mixture. 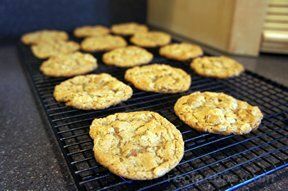 With a small scoop, drop the cookie dough onto a greased cookie sheet. Bake at 375° F for 10 - 12 minutes. While the cookies bake, mix together all of the frosting ingredients until smooth. Frost the cookies while still warm. 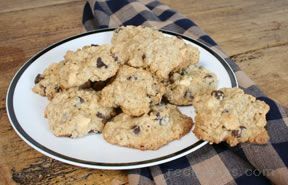 "Good oatmeal cookies. I liked the glazed frosting on them. It had just a hint of cinnamon flavor, which was a nice touch."